Sorry for the long overdue tutorial wrapping up this keying series. Here is the advanced keying template video, along with a flowchart and download link to the template scripts, which you can save to your toolsets for your own use in your nuke scripts. Some of you have asked for source materials for keying practice. I can provide you with a few free downloads so you can practice. http://www.thefoundry.co.uk/products/nuke/learn1/ – scroll down to 2d compositing | Compositing Basics. Click on the link that says Download Assets for Basic Workflows (535 MB). Here you will find the girl and desert BG found in this tutorial. https://mango.blender.org/ – Tears of steal open source project. Free 4K footage for people to download and practice. Highly recommended. scroll down to the blog post called ALL 4K FRAMES – NOW AVAILABLE ON XIPH.ORG. Finally, I want to thank everyone for your continued support, views, shares, comments, and emails. It all means a lot to me and you’ve certainly motivated me to keep going. Thank you. As always, if there are any questions, just leave a comment or shoot me an email and I will try my best to respond. Hopefully with this series of tutorials, and now this template, you guys will be fully equipped to handle even the toughest of keys. I’m going over the first section of Despilling. I talk about what despill is, why you need to remove it, how it should be separated from the alpha process, and combining core and edge despills. Here is the link to a great despill tutorial which goes over blending BG colors using the difference matte of a despilled plate –> to the original plate. If you are new to the concept of blending your despill with the background then you are really going to like this video. He talks about flame in the beginning of the video and switches to nuke later. Thanks for watching, next I’ll go over how to achieve and control the despill to get what you need. Sorry for not posting in a couple months, I have been traveling and working. But I am ready to finish off this series. I think you guys will like this one because I go over some techniques on the IBK workflow. The first part of the video I show you a comparison between how I usually see IBK being used and the IBK stacked technique. There are 4 examples (a greenscreen, a bluescreen, a hair problem, and a shadow problem) that I go over and explain the concept of what the IBK is doing, and the importance of the IBK Color, or cleanplate. Next I give you a step by step breakdown of how to setup this IBK stacked techniques by building these 4 examples from scratch. If you are already familiar with IBK and want to jump into the step by step process of this stacked technique, you can just to 7:09 (Step by Step process, example 1 greenscreen). At one point, my cursor disappears in the recording. Something must have gone wrong during the recording process, but you should still be able to see me clicking and marquee-ing stuff. I’m glad to be moving onto the despill section, as I think it usually is overlooked. In reality it’s just as important as the alpha, if not MORE important. A new name accompanied with some new tutorials to christen the site. It’s been a few months, I’ve been working hard both at work and on side projects, one of which is the daunting task of categorizing and analyzing all of the gizmos and tools on Nukepedia.com. I came up with a good workflow to check the tools, and I am going 1 category at a time, but it is pretty time consuming. I’ve also been working on an Advanced Keying Breakdown, which I will be posting for the next month or so. 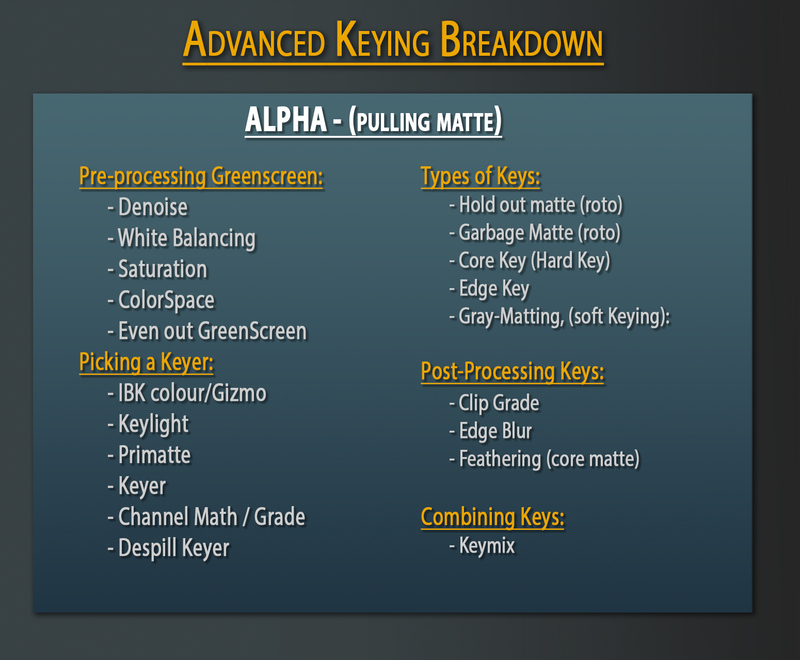 It is very in depth, more than I have seen from any other keying tutorial yet. It focuses on the concepts and techniques of keying, rather than specific tools. If you like what you have been seeing on this website, please share with others, I’d like to get these tutorials out to anyone who needs them. Thanks! I chose a group instead of a gizmo because it is easy to just drag and drop into any script without any fuss and will work on multiple machines or networks. Gizmos will break if it cannot link to the main file properly. Anyways just drag and drop this guy into the script and voila, deinterlaced video. Let me know if it works for you, if it has any bugs, or needs any updates. It’s a good Idea to deinterlace the video and to convert the .mov provided into an image sequence, and I will tell you guys how to do that in the next video. This is my first tutorial, I am sure I will get better as I go along, but please let me know some feedback. Too fast? too slow? to boring? etc. I’d be glad to hear. Thanks and I look forward to posting more videos.